The man who davens (prays) next to me in the mornings looked very happy. He announced that last night his daughter became engaged. "Wow! Mazal tov. Mazal tov." This is a big thing for anyone, but it is especially big in the Charedi world. I asked him how many more he had left to go (kids to marry off). With a huge smile he said, "This is it." "How wonderful! Mazal tov, again. Are you going to dance with a broom?" 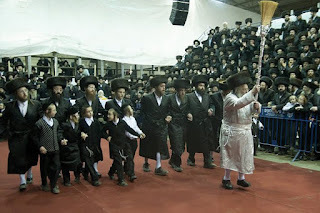 There is an old Chasidic custom that when the last child is married off the father dances with a broom. Still smiling he said, "Yes, but I do not know why." I explained, "You dance because you are so very happy to marry off your last child. And you dance with a broom because now that the last kid is out of the house, guess who gets to sweep the floors?" He laughed, and nodded his head. All of our customs, and all the more so all of our laws (even the statutes that do not seem to have logical reasons), have wonderful reasons behind them. When we follow a rule or a custom without knowing the reason we do it, it can (G-d forbid) become a burden. But when we know why we follow each tradition, every time we do one it becomes an uplifting experience. The Torah does not come to give us a burden. It comes to take a burden away.